It's the next new thing in diets. Or maybe it's an old thing with a techno-sounding name. It refers to the study of how our circadian clock affects metabolism, and how food intake works with circadian rhythms. Animals eat according to circadian rhythms, but research into the impact on humans -- if any -- is lacking. 1. Fast for 2 days a week (eat no more than 25% of your daily calorie requirement); eat normally on the other 5 days. 2. Fast on alternate days (say, Monday-Wednesday-Friday); eat normally on the other days. So far, research hasn't shown that this diet is more effective than simple calorie restricted diets in the long run. Weight loss is not significantly different when compared to subjects on standard calorie restriction. The other catch is that intermittent fasting plans, which call for 2-3 days a week of fasting (or eating very little), are hard to maintain for long. Studies have high drop-out rates. Nevertheless, some people who can stick to this type of plan have success with weight loss. 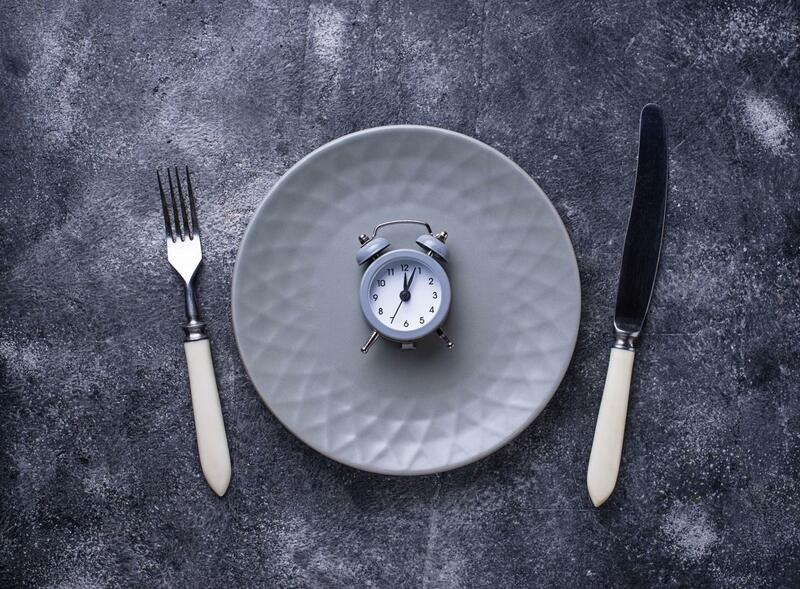 Recently, another variation on fasting has gotten attention: time-restricted eating. It's sometimes referred to as a 16:8 fast, because you consume all your food for the day during an 8 hour period and then have nothing except water for the other 16 hours. For example, breakfast at 8, lunch at 11, dinner at 5. Again, no food or beverage intake during the following 16 hours. It helps that some of this time is spent sleeping. And depending on where you start and stop your 8 hours, this type of plan could work with many people's daily schedules. For plenty of people, this much time restriction is very different from their typical eating patterns. If you consume a small or modest breakfast, say at 7:30 a.m. (beverages count as food consumption), you might not eat lunch until noon or 1, then may eat again anywhere from 3-5 and have supper later, between 6 and 8 or even later. Your overnight fasting period will be less than 12 hours. If you eat late at night, it's even shorter. Is this type of plan any better than intermittent fasting or calorie restriction? Research has some interesting results. Consider a small study reported recently. 16 weight stable subjects (age 29-57, BMI 20-39) were put into two groups. One group ate as usual. The other was asked to push their first meal back by 11/2 hours and move their evening meal forward 11/2 hours. In other words, they ate all their daily food in a time period that was 3 hours less than their usual plan. Other than that, no one was asked to restrict calories or change food choices. The study lasted 10 weeks. The time-restricted group ate fewer calories, even though they were not asked to do that. Body weight did not change significantly between the groups, but the time-restricted group lost significant body fat. At the end of the study, participants were given a questionnaire. The time-restricted group felt it was difficult to stick to the regimen, frequently violating the time limit due to social events, work demands or illness. Over half felt they could not stick to the diet longer than the 10 week study period. Another study that involved trained male athletes had similar results. Again, food intake was not restricted in amount, but the time-restricted group was expected to consume their 3 daily meals at 1 p.m., 4 p.m. and 8 p.m. They fasted for 16 hours. At the end of the 8 week study, the highly trained male athletes in the time-restricted group had lost 16% of their fat mass, despite keeping up their calorie intake. Lean body mass did not change significantly. They also had lower glucose and insulin levels. In another study, 23 obese subjects adopted a 16:8 style eating plan for 12 weeks. They were not told to restrict food intake, but were asked to consume all food for the day between 10am and 6pm Calorie intake decreased by an average of 350/day, from almost 1700/day at the start to 1330 calories/day at 12 weeks. Body weight decreased by an average of almost 3%, from an average of 210 lbs to 202. So they lost an average 8 lbs over 12 weeks, or about 1-1/2 lbs/week. You might not see this as a dramatic result. The interesting point is that they were not told to restrict calories. For some reason, the 16:8 diet led them to spontaneously eat slightly fewer calories. As with the athletes in the above study, these obese subjects lost fat mass but not lean body mass. Why would restriction of food intake to a controlled time period each day affect metabolism? There are many theories, but no definite answers. Researchers speculate that a prolonged fast during each 24 hour period resets hormones to favor fat burning, and that the digestive system can reset during that period. The clear conclusion is that more and larger studies are needed. Combining a time-restricted eating schedule with a reduction in calorie intake might be effective for weight loss. Or a time-restricted eating pattern might be an effective long term plan to maintain weight loss. After 12 weeks on the diet, both groups lost weight, but the Breakfast Like A King group lost 2.5X as much weight as the other group: an average of almost 20 lbs lost vs. 8 for the Big Dinner group. The breakfast group also had significantly lower triglycerides, blood glucose and insulin. Conclusion: shifting calorie intake to earlier in the day is an effective weight loss strategy. Unfortunately our cultural norms and meal patterns don't fit easily with this sort of plan. Breakfast is typically a small or non-existent meal, while we usually like to enjoy a big meal at the end of the day, sometimes followed by more eating later in the evening. Demands of work, commuting and family life don't leave time for a big breakfast every morning. And we like to wind down later with a nice meal. What to do? First, in order to take advantage of the metabolic changes attributed to a bigger breakfast, you need to eat a bigger breakfast. This is particularly important if you usually skip breakfast, or worse, just consume sweetened coffee drinks and pastries. Breakfast should include high protein foods like eggs, cheese, yogurt, meat or plant-based protein foods like nut butters or refried beans. It should be low in added sugars and include high fiber foods like whole grains, potatoes, vegetables or fresh fruit. If you don't feel like you can shift half your calories to the morning meal, try for 1/3 of your calories. The small evening meal is another challenge if you're used to eating a substantial meal. Again, if you can't cut this back to a mere 15% of your daily calories (as with the study above), go for 1/3 or 1/4. One way to do this is to focus the meal more on vegetables. If your evening meal is a big green salad or a big plate of stir fried or roasted vegetables, you can still relax over the meal, and feel like you ate something filling and substantial, while restricting your total calories. An example of the small evening meal in the study was described as scrambled egg whites and slices of turkey breast. Yuck! That's not a meal. It sounds like punishment. A big green salad with a splash of olive oil dressing and vinegar and a shake of grated Parmesan for flavor sounds much more appealing and healthy, not to mention filling. A plate of roasted brussels sprouts seasoned with garlic, salt and pepper is another good choice. Shift more of your food intake to earlier in the day, and eat less in the evening. Try to restrict your food intake to a shorter period during the day. If you can't manage the 8 hour window of the 16:8 plan, try for 9 or 10. One of the keys is to eat/drink nothing caloric during the fast period. If your fast is 14 hours rather than 16, you can still get some benefit. Chunky salads with vegetables like tomatoes, peppers, onions, zucchini, snap peas, radishes, fresh asparagus, celery and cucumbers. For more information on the pros and cons of intermittent fasting and time-restricted feeding, check out this MyNetDiary blog post from last December.